When China secured the bid for the 2008 Summer Olympics seven years ago, the communist regime was elated. It was a chance to prove that China had entered the stage as a full-fledged world power, with all the sophistication and advancements that make-up life the first-world. It would give the government a chance to portray China as a country where Communism finally succeeded.To win the bid, the regime had made promises to ease human rights violations and grant foreign media the same rights they would enjoy in a free country. They had argued that hosting the event would boost the country’s economy and improve social conditions for everyone. The country even promised to make the event a “green Olympics,” despite the fact that China is one of the most environmentally unsound countries on the planet. Sixteen of the world’s twenty most polluted cities are in China, seventy percent of its major rivers are “severely polluted,” eighty percent are unsafe for fishing and over half its citizens drink water that does not meet World Health Organization standards. Pollution is one of the nation’s greatest killers. Not surprisingly, the regime has violated many of the Olympic promises it had made. It has turned the Olympics into a propaganda campaign to change the international conception of China as a repressive totalitarian regime. Whether or not this effort will be successful, depends on the reaction of the West in face of the spin they will witness over the next two weeks. In spite of promises that the Olympic Games would improve the lot of the Chinese people, it has lead to a dramatic increase in their repression. This began seven years ago when the country first won the Olympic bid. Immediately, it implemented an “Olympic beautification” program, to hide some of the harsher realities of life in Beijing. Thus, thousands of the city’s poorest residents were forcefully evicted from their homes and shops, which were leveled. Many of these unfortunate people are still seeking compensation for their losses. However, the project has not only boxed in the city’s poor, it has hurt them financially, since many earn their living selling goods to passers-by. The walls have literally cut them off from their clientele. Beijing is also an unsuitable location for the Olympic Games for health reasons. The air quality surrounding the city has some of the highest levels of the toxic gas, nitrogen dioxide, in the world. Draconian measures employed by the government to clean the air, have included shutting down factories, stopping all “dust creating construction” and greatly restricting car traffic in the city. Although these measures have improved the air quality, to some athletes, such as Ethiopian marathon runner Haile Gebrselassie, it is still not up to snuff. Although he is ranked number one in the world, he has decided not to participate in the marathon event, complaining that the pollution irritates his lungs. Some athletes are even refusing to train in China, preferring to stay in neighboring countries and only traveling to Beijing for their event. Water quality is also a concern. This became particularly patent when out of control algae growth, due to fertilizer runoff, turned Lake Tai into a foul-smelling mess, threatening to force the Olympic rowing events to another location. Fortunately, there were thousands of volunteers on hand to remove the muck by hand. The media also are angered by China’s failure to fulfill pre-games promises to give them unfettered access to travel the country and interview Chinese, and also allow them unrestricted access to the internet (since Chinese citizens’ internet use is controlled, this had to be stipulated). The regime does not seem to realize that restricting the freedoms of those who will be reporting on events is not a sound plan to gain good press. Perhaps the most telling aspect of the true state of China is the measures the government is taking to ensure that things run smoothly during the games. In addition to imprisoning, relocating and walling in potential discontents, the government has turned Beijing into a veritable war zone to prevent any forms of violence from breaking out during the event and frighten any would be protesters. Such a warlike atmosphere hardly reinforces the stable and peaceful image China hopes to portray. Perhaps that is a risk the government is willing to take since any public manifestation of opposition to the regime would destroy its olympic propaganda effort. However, this propaganda effort is a farce of olympic proportions. It is simply an effort to lend the repressive totalitarian regime a note of legitimacy. Although many leaders of the international community are supporting this effort, worldwide public opinion cannot be muscled around like the enslaved Chinese masses. 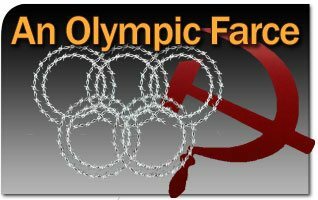 The Olympic Games will project the harsh reality of Chinese Communism throughout the globe and this could cause plans to backfire. It all depends on the reaction of the international community to what it sees and hears coming from Biejing. It is up to the West to courageously confront reality. It must admit that China is not just a provider of cheap labor, but an evil empire that continues to support itself on European and American money. It must take steps to inhibit the waves of money being sent across the bamboo curtain. May Our Lady the Queen, Empress of China guide the world as it confronts this challenge. This entry was posted in Fighting for our Culture and tagged news commentary by Michael Whitcraft. Bookmark the permalink.